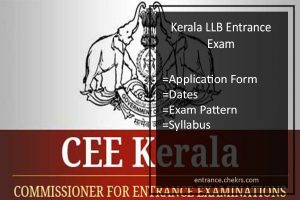 Kerala LLB Entrance Exam 2017 Application Form- केरल एलएलबी प्रवेश परीक्षा आवेदन पत्र: Commissioner of Entrance Examination (CEE) has announced notification for admission into three and five year integrated law courses through Entrance Exam. Interested and eligible applicants must therefore apply by filling Kerala LLB Entrance Application Form 2017 soon before the last date. Therefore aspirants who are interested to excel their career in Law can check here Kerala LLB Entrance Exam Date and accordingly apply for it. In regards to more details such as KLEE Admission 2017, eligibility, KLEE Exam Syllabus along with exam pattern, go through the article below. Applicants must posses Bachelors Degree in any discipline from University of Kerala or other recognized university. The KLEE exam pattern includes multiple choice question with a total of 600 marks on the following sections. For more updates on Kerala LLB Entrance Exam Application Form 2017, stay tuned to our portal. Incase of query place it in the commenting section below.